Teachers should note that some interviews contain many graphic accounts of horrifying cruelty and violence that may not be suitable for younger students. Front view of the railcar on display at the U.S. Holocaust Memorial Museum. 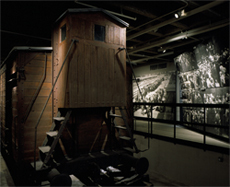 Credit: Edward Owen, courtesy USHMM Photo Archives. Find many resources for teachers striving to help students learn the history of the Holocaust and reflect upon the moral and ethical questions raised by that history. Schedule a field trip, traveling trunk or classroom presentation by Holocaust survivors or their families, all free for local schools and community organizations. Teaching guide with online instructional video. Use this guide to improve your history curriculum using the Thinking Like a Historian model. The model uses five types of inquiry that form the building blocks of historical critical thinking. The guide offers lessons and classroom activities that tie into essential questions of history. Provides ideas for teaching history from K through 12 levels. Teaching guide that contains ideas for using original sources with secondary-level students. The Holocaust is a watershed event in history — a frightening reminder of the consequences of prejudice and intolerance. It raises questions of fairness, justice, individual identity, peer pressure, conformity, and obedience. For these reasons, the topic is both timely and teachable. The Wisconsin Holocaust survivors' oral histories contain many powerful concepts to teach about the Holocaust. You may find it easiest to start with excerpts from our Oral Histories Wisconsin Holocaust Survivors collection and integrate them with the activity ideas listed below. Integrate these activities with topics from the Wisconsin Holocaust survivor excerpts. Because the stories are emotionally moving, sharing in groups will help students process their feelings as well as provoke discussion. Have small groups answer specific questions and adopt positions. Use a pyramid: discuss in pairs, then small groups, then larger groups. Ask students to take sides on an issue. Choose groups of 2 or 3 to brainstorm, then have them present their positions in front of the class. At the start of a class, have students write what they think about a topic. At the end of the class, have them explain how their thinking changed. Each student assumes the persona of a survivor. They tell a story from the survivor's point-of-view and answer questions about what they would do in such a situation, and why. how does... connect with what we have already learned from... ? what do you think causes... Why? what is another example of... ? what is another way to look at... ? what are some differences between... and... ? why do you think that... ? This book contains 14 interviews of Holocaust survivors who later settled in Wisconsin. With words and photographs, they describe the richness of prewar life in Europe; the advent of proscriptive laws, arrests, and deportation; the horrors of Nazi camps; and ultimately, liberation and postwar experiences.